Go to your favorite fantasy baseball site (assuming it is not this one) and see what they have to say about former fantasy stud, Carl Crawford. Chances are they suggest that Crawford can probably rebound from his poor first season with the Red Sox but they preach caution due to the wrist injury. That kind of blurb makes a lot of sense. I am not very concerned with Crawford's wrist, but first a look at last season. The most mentioned aspect of Crawford's 2011 season was probably his lousy start. It truly was abysmal. For March and April of the 2011 season Crawford had a wRC+ of 10. That's not just bad, that is like he was not even standing at the plate when they called him out. His career wRC+ is 110, which is slightly above average. For reference purposes, Albert Pujols has a career wRC+ of 167 and Yuniesky Betancourt's career number is 78. 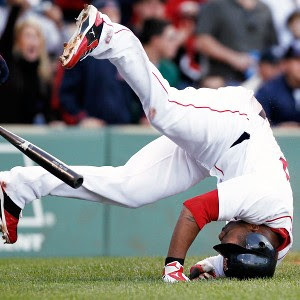 The rest of the season looks pretty normal - May 114, June 102, July 69, August 111, and September/October (when the entire Red Sox lineup went into a slump) he was at 91. Take out April and a lousy injury-plagued July (only 48 at-bats) and he is pretty close to his career numbers. The funny thing about that is I was expecting a career season from Crawford in 2011. Heading to the offensive environment of Fenway Park from the run suppressing Tropicana Field should have been a net gain for Crawford. Fenway does reduce lefty homeruns (by almost 20 percent the last three seasons) but pretty much boosts everything else. And Crawford was better at Fenway than on the road, a 92 wRC+ at home and a 76 on the road. Carl Crawford was never a great hitter against left-handed pitchers and during the 2011 season he was worse than ever - 48 wRC+ versus a career 82 against lefties (career 113 against right-handers). Having a more typical year against lefties would bring his numbers almost right back where they should have been. On June 17 of the 2011 season Crawford left the game with a strained hamstring. He was placed on the 15-day disabled list despite the injury being designated a type-one strain, the least severe. I felt at the time that the Red Sox were using the injury as an excuse to give Crawford a little break from his woeful season. I still believe that to some extent, but he did miss an entire month and that suggests the injury was more severe than was reported. This might have contributed to his low stolen base total. In September he missed a couple of games with neck soreness but this truly was minor. In January when it was reported that Crawford would require surgery on his wrist Red Sox GM Ben Cherington told the Boston Globe that Crawford had experienced discomfort in the wrist during the 2011 season. This had not been previously reported, Cherington elaborated that Crawford sometimes had the same discomfort while with the Tampa Bay Rays. The surgery, which Cherington called “relatively routine,’’ was performed in Arizona by Dr. Donald Sheridan, who also operated on Crawford’s right hand in 2008. He was expected to be ready close to Opening Day. Crawford seemed ahead of schedule at the start of Spring Training but suffered a set back when the wrist was hit during bunting drills. He may miss the first couple of weeks of the regular season but is expected to be 100 percent healthy at that point barring any further set backs. The wrists are important to a hitter, especially when it comes to hitting for power. Crawford is not a slap hitter but it would be wrong to call him a power hitter. Plenty of power hitters have had wrist surgery and returned to hitting as before. What usually happens is the power doesn't return as quite as fast, but it does come back. You would not draft Crawford for his power except as relative to the Michael Bourns and Brett Gardners of the player pool, especially as a lefty in Fenway Park. By all the reports I could find this was relatively simple, routine surgery. It was initially expected he could be a participant in Spring Training games and be ready for Opening Day. He also apparently played through the wrist discomfort for years before he needed to do something about it. This suggests to me that the problem was very small and has been fixed. The rest is just getting it strong again. Most Red Sox analysts have come to the conclusion that Crawford after signing his record contract put too much pressure on himself to live up to it. That is probably at least a small part of what happened. I believe that the egg in this situation was just bad BABIP variance. Once he was already off to the bad start he may have put too much pressure on himself to snap out of it. That pressure was not necessarily a bad thing as it seemed to have rebounded his game in May. Then the injuries hit and sucked away what momentum towards a rebound he had built. You know that saying "If it were not for bad luck, I would have no luck at all"? Carl Crawford lived that during the 2011 season. Crawford could not seem to draw an ounce of good fortune the entire season. The bad start, the pressure of the contract, the injuries and finally the team collapse all led to a career worse season for Crawford. Simple regression to his career numbers would be enough. If the universe is fair (yeah, it probably is not) Crawford will have some good luck in 2012. I'm sure Crawford would gladly accept no luck at all. I love this game a lot!One of my hobbies!